VacufilTM disposable Vacuum Filtration units are very useful in large volume samples separation and purification for tissue culture media, biological fluids and fixation buffers. The unit includes membrane filter, graduated funnel of clear polystyrene with polyethylene neck adapter and polystyrene reservoir bottle with a separate sterile polyethylene cap. Glass fiber pre-filter is available. 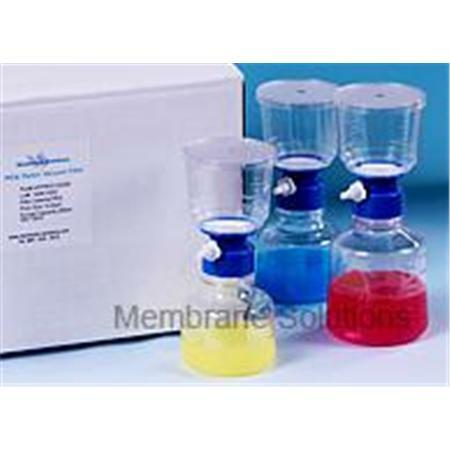 Two membranes are available to meet all of your filtration needs: PES and MCE. Available in three styles: complete filter/storage unit and bottle top filters and the reservoir bottle. Sterile filtration and clarification of difficult-to-filter aqueous solutions with a glass fiber pre-filter. PES Provides fast flow rates and very low protein binding and extractables than cellulosic or nylon membranes, highly recommended for filtering and sterilization cell culture media, biological fluids of aqueous solutions. MCE Especially recommended for applications requiring low protein binding, such as filtering culture media containing sera. Each individual unit is lot-numbered for easy identification and tracking. Glass fiber pre-filters may be placed in the funnel on top of the membrane and secured by a convenient tab for difficult-to-filter solutions.